We believe based on the original survey map, that there are two portions of Potter's Field. The known or referenced portion was used to bury Jane or John Does, Non-Whites* (largely Native American, African American, Chinese American, Japanese American, Mexican American), Family Farmers, Farm Workers, Former Slaves, Gold Miners, Sailors, Carpenters, Stone Cutters, Brick Layers, Seamstresses, Restaurant Employees, Servants, and the Poor. We believe the unknown portion of Potter's Field was reserved for anyone labeled insane, criminals, or those that died from epidemics. The exact date of the origins of Potter's Field is unknown. However our best guess was it probably started sometime in the early 1840's with the influx of settlers prior to the gold rush of 1849. It would definitely have been in place by the time of the first official execution in the newly formed County of Contra Costa in 1852, with Martinez having become the County Seat. Potter's Field was considered the unofficial county cemetery as they paid for the burial of its residents to the property owners. It became the official county cemetery when the county purchased the land in 1892. 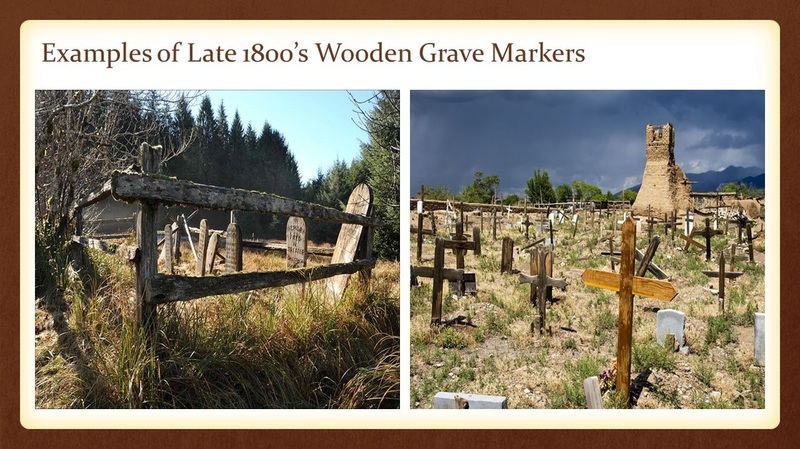 The examples above are of the type of wooden grave markers that we believed were used in the known portion of Potter's Field along with natural markers such as rocks or branches. Those in the unknown portion most likely were not given any marker at all as they were believed unworthy of them. It has been largely reported by many sources that most of these were probably destroyed during the great Martinez Cemetery fire of 1872, (exact details of the fire have not yet been found). Due to the date of the fire occurring close to the origins of Potter's Field, families and friends would have been able to replace most of them. The natural markers would have been lost over time. *They were not allowed to be buried in the main cemetery until at least the 1930's with very few exceptions.